We bake our ready to decorate genoese sponges from scratch ingredients in the traditional way, but not everyone has the time or inclination! After many customer requests, we now offer easy to use cake mixes for those who enjoy home baking but need the reassurance of consistent results every time. You have the flexibility to bake whatever shapes and sizes of sponge you need - big cakes, little cakes, novelty shapes and muffins! Our vanilla or death by chocolate sponge cake mixes, packed in 3kg boxes, are extremely versatile and tolerant to a wide range of baking conditions. The will produce a close textured moist cake, firm and easy to handle, which should keep well for at least 2 weeks. The results will not be identical to our ready baked genoese bases, as these are baked from scratch ingredients and cannot be recreated exactly in a cake mix, However, cake baked using these mixes will be just as suitable for decorating, and you have the advantage of being able to add extra ingredients and flavours - fruit, chocolate chips, lemon flavouring? A three kilogram box will be plenty to make three large 10" square cakes, or six 8" round cakes. You can also get between 130 and 200 cupcakes from one box, depending on the size of your cakes! 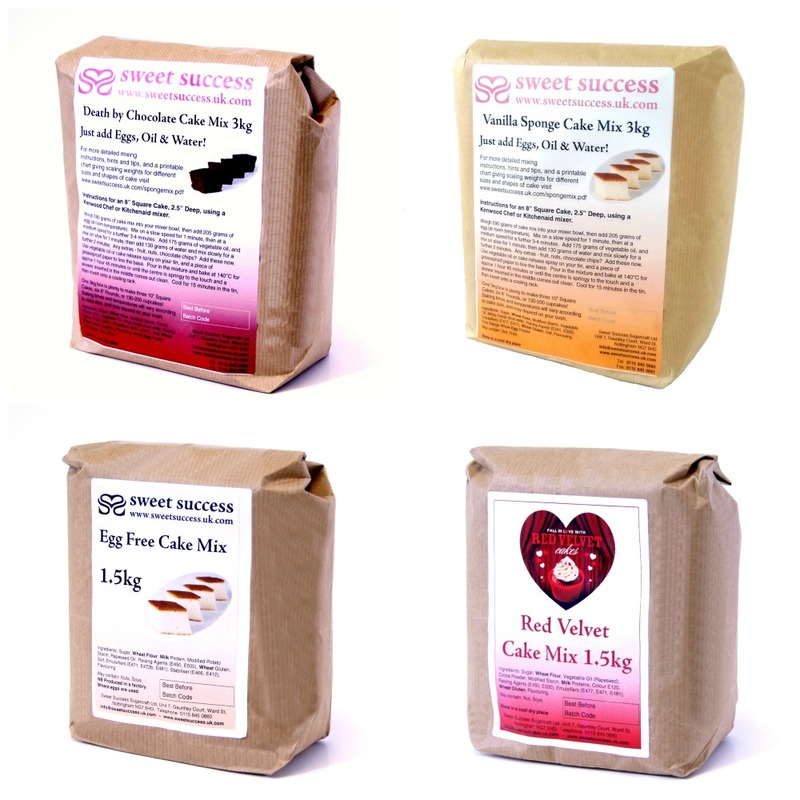 We also now offer Red Velvet and Egg Free sponge cake mixes, all available in 1.5kg bags. With a subtle chocolate flavour, moist texture and striking colour, Red Velvet is the lastest cake craze from America to hit the UK. A 1.5kg pack of Red Velvet Cake Mix is plenty for three 8" round cakes, or 60-90 cupcakes depending on size. Instructions are included for an 8" round cake, or download a chart showing instructions and quantities for other sizes here. Instructions for our Egg Free Sponge mix are here. May contain: Nut, Soya. Suitable for Vegetarians. Ingredients: Sugar, Wheat Flour, Vegetable Oil (Rapeseed), Cocoa Powder, Modified Starch, Milk Proteins, Colour E120, Raising Agents (E450, E500), Emulsifiers (E477, E471, E481), Wheat Gluten, Flavouring.